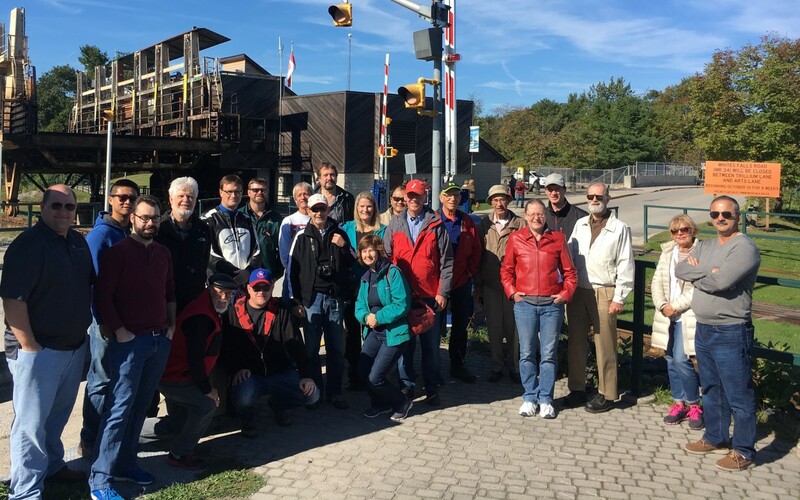 On October 1st, Parks Canada hosted PEO Simcoe Muskoka for a tour of North America’s one of a kind Big Chute Marine Railway in Coldwater. The tour was facilitated by Parks Canada’s Mary Macleod, accompanied by Kevin Carney and Campbell Trueny. Mary and her team started the tour at the old marine railway where it all started, and explained the limitations of the existing system which eventually made room for the current system that continues to be operational today! A tour of the machine room provided further insight into the true ingenuity of this system. Four 200 horsepower (150 kW) electric motors provide traction by cable through a series of pulleys which transport and lift the “cradle” nearly 20 meters from the Six Mile Lake Channel to the Trent Severn Waterway. We were lucky enough to witness this engineering marvel in action as two boaters approached the lock! Incredibly we had two of the original engineers who worked on the design/construction of the BCMR participate as Guests at this event, and the feeling of nostalgia was inspiring and contagious. Overall, this was an exciting tour that illustrated and exhibited the railways remarkable and continued ability to stand the test of time given its unique design. We would like to extend a thank you to Mary, and the rest of the Park’s Canada team for making this visit one to remember! This entry was posted in Tour and tagged big chute, tour. Bookmark the permalink.